The pace of business is faster than ever before. Due to the rapid adoption of cloud and mobile computing, driven by consumerization, operational needs, and security requirements, ESG believes that Identity and Access Management (IAM) is undergoing a profound transition. 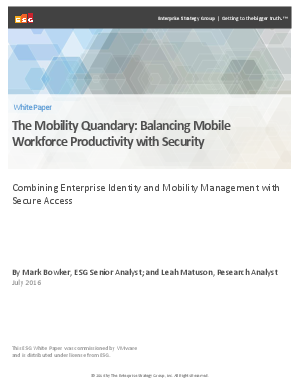 Download this ESG whitepaper to learn why organizations should combine Identity and Access Management (IAM) and Enterprise Mobility Management (EMM) solutions to adapt to the influx of workforce mobility without interfering with user experience or compromising security.